Mírzá Mihdí (Mehdí) was Bahá’u’lláh’s youngest son. Born in Iran in 1848, he was a gentle child that loved his Father very much. From a young age, he accompanied his Father on His exile without complaints or requests. His life was the perfect example of complete detachment and unconditional love. “To the galling weight of these tribulations was now added the bitter grief of a sudden tragedy — the premature loss of the noble, the piousMírzá Mihdí, the Purest Branch, ‘Abdu’l-Bahá’s twenty-two year old brother, an amanuensis of Bahá’u’lláh and a companion of His exile from the days when, as a child, he was brought from Tihran to Baghdad to join his Father after His return from Sulaymaniyyíh. He was pacing the roof of the barracks in the twilight, one evening, wrapped in his customary devotions, when he fell through the unguarded skylight onto a wooden crate, standing on the floor beneath, which pierced his ribs, and caused, twenty-two hours later, his death, on the 23rd of Rabi’u’l-Avval 1287 A.H. (June 23, 1870). His dying supplication to a grieving Father was that his life might be accepted as a ransom for those who were prevented from attaining the presence of their Beloved. The emancipation of women. Tahirih, the poet. Many women have been born into the world when the concept of the equality of opportunities for men and women are part of the common structure of society. Many women have lived through the changes and developments while many others have fought until their very last breath to see this dream come true. One of this women that to me is the FIRST woman in the world to publicly speak about the emancipation of women was Táhirih. 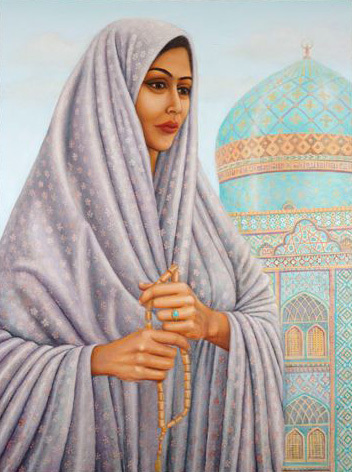 Born in Qazvin, a city of Iran around 1817-1820 (her exact date of birth is unknown due to the fact that her birth certificate, along with other of her possessions were burnt after she was killed), Táhirih was the daughter of one of the most prominent Mullahs of the region and was well educated in Islam and the Quran. Her father often lamented the fact that she was a woman because of her brightness and enlightenment – he thought if she had been a boy that she would have been his successor. She believed in the teachings of Siyyid Kázim thus accepting the truth that the coming of the Promised One was close. After his death, Táhirih would tell others about the coming of the promised Qa’im through a curtain (back then women were not allowed to appear in public without a veil). A few years after this, the Bab was made Manifest. The first eighteen people to believe in Him are known as the “Letters of the Living” and Táhirih was the only woman amongst them. She recognized the truth of the Bab through a dream and immediately began to teach His Cause which was the reason for many to embrace the Bab’s Faith. She was already known as one of the most learned women of the time and this made the clerics nervous. Táhirih -as well as many other believers- was arrested, insulted by the crowds and disgraced by her family. She traveled the region delivering the Message to those who would hear and encouraging the friends to do so as well. Wherever she would go, she would fiercely defend the truth of her newly found Faith and she gained the respect and admiration of people in all social classes. After being held as a prisoner upon returning to her home, she left to Tehran. It was around that time that something amazing occurred. The conference of Badasht where Babis got together to discuss matters concerning their new Faith happened. Táhirih, Quddus and Baha’u’llah were amongst those who attended and it was there where Táhirih, that courageous poet and hero rose and unveiled exclaimed: “The Trumpet is sounding! The great Trump is blown! The universal Advent is now proclaimed!”(Memorials of the Faithful, Pages 191-204: gr27). The response from those present was as can be expected with a mix of confusion, anger and surprise but Baha’u’llah calmly managed to restore order and peace amongst them as they read Passages from the holy Writings that spoke of this day. She was the essence of purity and courage!! Even the new Shah of Iran was taken by Táhirih and her eloquence. He had ordered for them to leave her alone and let her be. However, this is not what happened. After the Bab died, some years later Táhirih sensed that the time for her to finally be in the presence of her Beloved had arrived. She dressed in a very elegant white dress, bathed and put rose water perfume on as if she were going to wed. She farewell to everyone and soon a group of guards took her to a garden -without the Shah’s knowledge. Some time before she was strangled with her scarf she, with true conviction proclaimed: “You can kill me as soon as you like, but you cannot stop the emancipation of women!”. And this is exactly what happened. Not only an outstanding woman but a wonderful poet. You can read one of her poems here. Shoghi Effendi, the Guardian of the Baha’i Faith referred to her as the first woman suffrage martyr (God Passes By, p. 75). Badi was born in Iran, in a town called Nishapur near Mashhad. His name was Áqá Buzurg-i-Nishapuri and was later given the title of Badi which translated to “the wonderful”. As a young child, he was a rebellious one which made his father (a devoted and outstanding Baha’i) worry. When Nabil Zarandi (author of the Dawnbreakers) came to Nishapur, one day he had a conversation with Badi which changed his life forever. He talked to Badi about the sufferings and tribulations of Bahá’u’lláh using a poem Bahá’u’lláh had written, Badi started to weep. The next morning Nabil told Badi’s father that the boy had lost himself and was completely given to God. Badi insisted on accompanying Nabil on his journey to spread the Faith of Bahá’u’lláh but his father asked him to wait until he was finished with his studies. Upon completion, Badi set off to serve the Baha’i friends as a water bearer in Mosul. After Mosul he again served as water bearer for friends after they were taken away as prisoners. Badi even though was hurt badly went ahead of the group to arrive early so he could continue to serve them. His heart was not at ease. Suddenly he was attracted to the Mediterranean. He went to the city of Akka (Acre) in what today we know as Israel. Since he was still dressed in the humble clothes of a water bearer, he entered the city without any problems of being recognized as a Baha’i (back then the city was heavily guarded and whoever entered was seen by the guards). Bahá’u’lláh was a prisoner in that city and Badi was blessed to meet with Him twice. During these interviews Bahá’u’lláh mentioned the Tablets He wrote to the rulers of the world of that time and the one addressed to Nasiri’din Shah of Iran. Badi humbly requested to be given the Table so he could deliver it personally to its destinatary even though he knew his life would be taken if he did so. Bahá’u’lláh agreed. Badi traveled alone, on foot without being able to contact any of the Baha’is on his way (this was due to the risks involved in his mission) for thousands of miles for about four months! I cannot even imagine undertaking a journey of that kind! What bravery! So much love!! It is told that he would constantly stop, turn to Akka and pray for God to help him carry out his mission. Upon arrival in Tehran, Badi went to where the Shah was on his hunting expedition. He waited on a rock for four days for the Shah and his guards to come across him. Badi was instructed that once he reached Tehran, to put on a white robe and hold the Tablet over his head so they could all see he had no weapons on him. All these things he did and when the Shah and his train found him, the Shah requested the letter to be brought to him since he believed it was a petition from someone. Badi told him it was not a petition but a command. Badi bravely told the Shah that His Beloved told him the Shah was going to kill him to which the Shah angrily replied: I won’t kill you so we prove your Master wrong. Immediately Badi was seized by the guards. The Shah ordered the Tablet to be sent to the clerics of Tehran for a reply to be prepared for Bahá’u’lláh. The clerics, ignoring this command suggested Badi to be executed. For three days, Badi’s body was tortured, branded with hot irons. They wanted to get information on the Baha’is but the more they tortured Badi, the happier he looked! It was as if he knew that the time of his martyrdom was rapidly approaching. These news were taken to the Shah who after looking at a photo of Badi while being tortured ordered for him to be executed, forgetting his previous statement; and action that fulfilled Bahá’u’lláh’s promise to Badi. After the three days, Badi’s skull was crushed with the back of a rifle and his body thrown into a pit and covered with dust and stones. He was only seventeen years old. After three months of this event, the Shah ordered for the Tablet to be taken to him. After reading some of it he shouted that the Tablet should be taken from him because if he read any more, himself would become a Baha’i. In the history of the Baha’i Faith since its birth in 1844 there have been countless individuals that have arisen and joyfully given their lives for their beliefs. In the next few posts, I will put up summaries of the lives of some of these blessed people. However, the reader must take into account that the details of the story I will write are clearly greater and victories in the course of their lives many more than I will recount. Most of my sources will be Baha’i books such as “The Dawn Breakers”, “Stories of Baha’u’llah” and several more. I will put the name of the books as needed. Hope the readers will find these stories as uplifting and empowering as I do. You will realize the immensity of their love and devotion as you read on.